JOIN THE MYHORSEFORSALE.COM NETWORK TODAY. 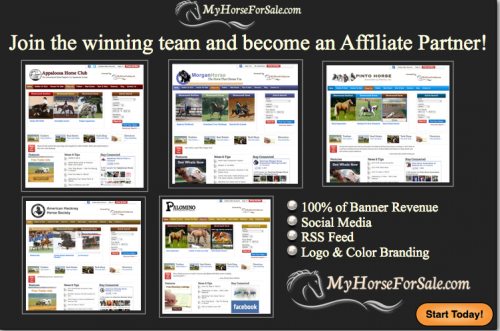 The MyHorseForSale.com affiliate program is unique in that it is customized for each association, club or business and provides ad content for viability along with corporate support. Start earning money for your club, association or business today. Call or email us today to learn more about the MyHorseForSale.com affiliate program, 405-485-4224 or sales@myhorseforsale.com. Our affiliate program allows clubs, associations and equine entrepreneurs a way to make additional revenue and have a pre-populated equine classified web portal on their existing sites. Call or E-mail us today at sales@myhorseforsale.com or 405-485-4224.